Located in the heart of Sedona, this vortex hike is a must for any tourist! Features and Interests: A well known vortex site said to boost physical and spiritual energy. Trail Description Starting out at the large Bell Rock trailhead, this trail starts you of on a nice flat and wide trail leading to the loop. In about 0.6 miles, you will come to the instersection with Courthouse Butte trail to the right. Liking to experience the nature with solitude, we take a right. This loop system essentially circles the southeastern side of Courthouse Butte, coming to a streambed. From here the trail makes a gradual climb, topping out at the eastern-most point of the Loop. With expansive views of the Munds Mountain Wilderness area you will also see a double parallel rock formation called the Rabbit Ears. Continuing around to the north, the trail drops across an expansive open rock area around the Spaceship Rock. 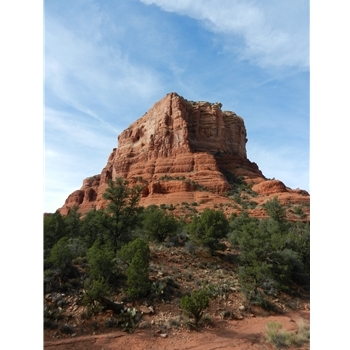 This smooth red rock mound is one of Sedona's lesser known vortex sites. Past Spaceship Rock, in about mile the loop reconnects with the Bell Rock Pathway. The trail takes a few steep drops and climbs, becoming much narrower in patches and quite rocky. The Baby Bell formation and Cathedral Rock can be seen directly ahead of the trail along with a spectacular vista of Sedona's red rock country. Reconnecting with the Bell Rock Pathway, you will take the northwest side of the Bell Rock formation back to the Bell Rock Vista parking lot.